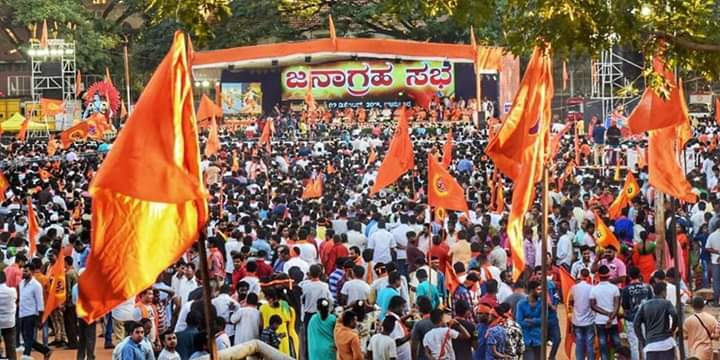 Thousands of Ram Bhakts assembled at National college, Basavanagudi, Bengaluru today in a Janagraha Sabha a public referendum towards construction of the magnificent Ram Mandir at Ramajanmabhumi Ayodhya, organised by Vishwa Hindu Parishat, Karnataka. 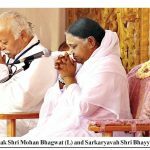 Sants from various mutts were present on the august dais prayed and urged for a magnificent Ram temple at Ayodhya. The speakers in the janagraha unequivocally condemned the courts not closing the case and said the respect to courts would still continue but the delay meted out is unacceptable. 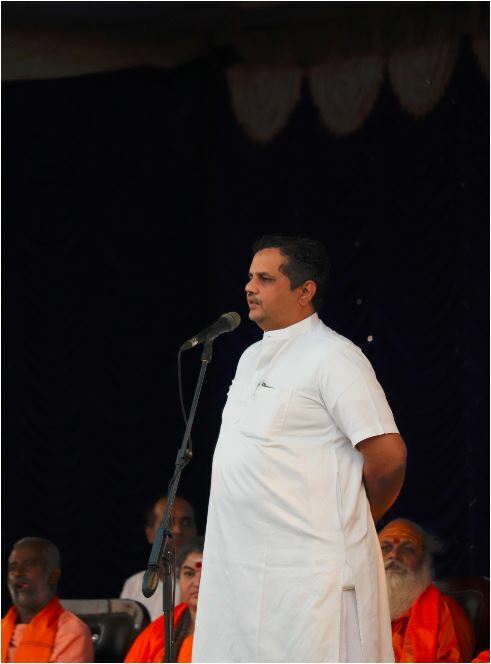 Sri Milind Parande, Secretary General , Vishwa Hindu Parishat introduced to the audience on the need for such public referendum. It is since the time of Babar the foreign barbaric attacker and such mindsets which have resulted in the issue of Ram mandir today he said. 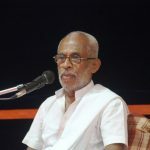 He expressed his agony terming it as shocking and appalling when the court hearing the Ramajanmabhumi case recently picked the hearing for mere 3 minutes and adjourned and went on record that court had higher priorities than this. Where thousands of people have laid their lives for the Ram Mandir and case being oldest, the court doing so is a humiliation to whole of the Hindu society he added. Without understanding Babar’s assault in this country and a masjid in his name will cease to exist in this country and a grand Mandir will be built very soon he said. Ram Rajya has been coined and the same explains justice and harmony to all. 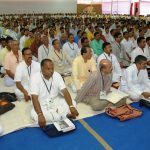 Rama japa is a therapy to Hindus. 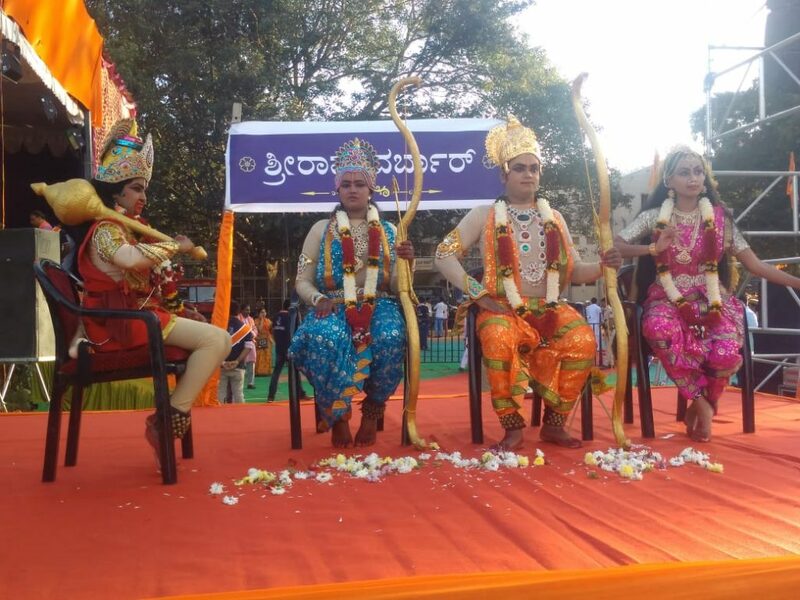 Though we had such conducive environment all around, and Ram Bhakts are in plenty, Sri Rama Temple construction has been delayed due to wrong intentions. 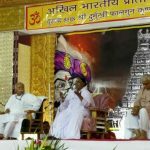 Magnificent Ram Mandir construction is the need of the hour and ordinance is the only way to make it happen and we urge for such an ordinance said Smt Vijayalaxmi Deshamane in her address. 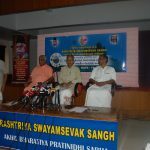 Sri Soumyanandanatha swamji of Adichunchanagiri Mutt also expressed pain wherein enough efforts towards Ram Mandir to worship Bhagavan Rama who has been not just idol but an ideal to all Bharatiyas has been put and we should not end up only with efforts alone but organize ourselves and execute it as soon as possible. 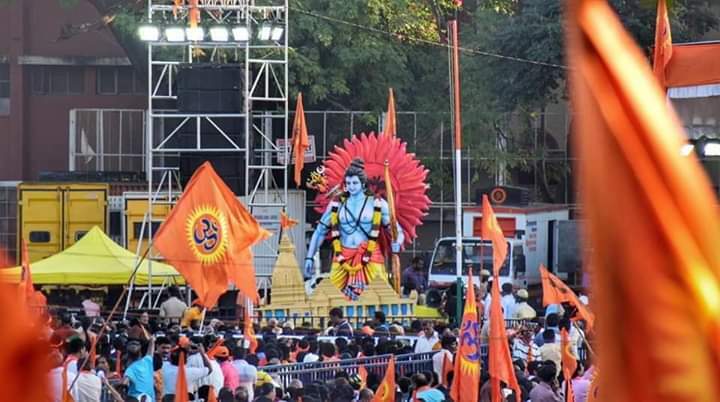 Sri Basavaraj who holds the responsibility of VHP in Karnataka Dakshina elucidated the resolution taken up by the sants in Delhi’s convention held in November. Starting on Dec 18 which happens to be Gita Jayanti Sri Rama Japa should be done personally and socially praying for the construction of Ram Mandir soon by everyone. 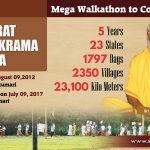 were the three resolutions he said and urged all the Ram Bhakts who were in the gathering to perform Rama Japa for a week from Dec 18 to Dec 25 with an intention of wishing the Rama mandira construction dream to come true. 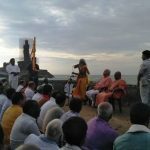 Sri Mukunda CR, Sahsarkaryavah of the RSS said the children of our country have been hearing the stories of Prabhu Sri Rama and a sad situation that urging for temple to worship him has come in the way. 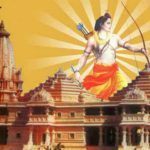 Since 1949, the priority of Rama Mandir has never been with the courts he said. The court has taken up and closed cases which were of least social, cultural importance. He said how the courts opened in the midnight to hear the mercy plea of Yakub Memon a terrorist. It is only Hindu society which has always been abiding by law of the land and constitution, but the same court has humiliated all of us by not considering Ram mandir plea as priority. The court gives time to belittle the Hindu traditional practice of Sabarimala and gives verdict which again hurts Hindus. This is the sole reason for such public referendums he said. To all those who believe that the upcoming elections is the reason for such janagrahas, they are wrong said. 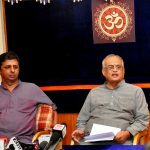 We are not getting in to politics to build the temple but it is an age old request which has been there and we have come to a junction where we have to pressurize the governments for an ordinance to make it happen. Elections come and go and that does not have to do anything with Ram mandir Sri Mukunda said. 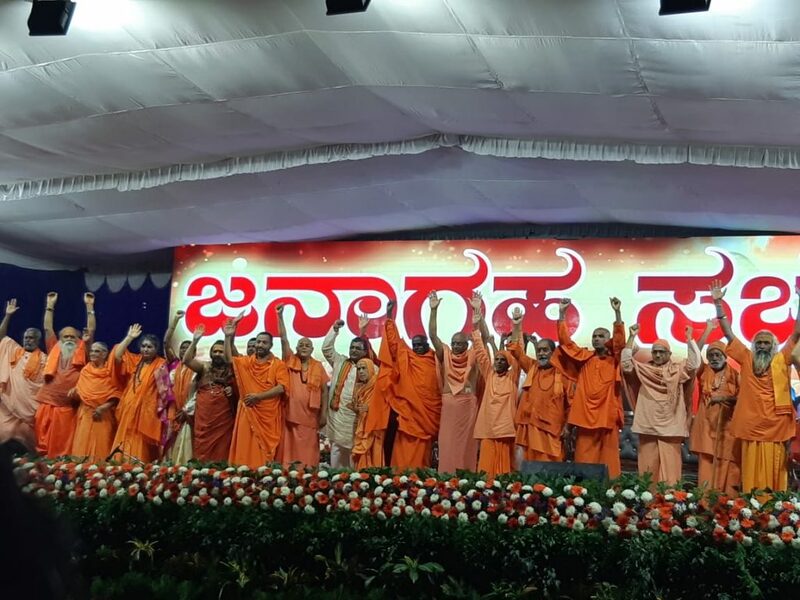 Pujya Sri Mahamandaleshwara Sri Akhileshwaranandagiri Maharaj who was at his oratory best engaged the Bhakts with slogans. 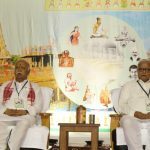 He said though unacceptable, the partition and division of the country has happened and we have accepted it, but we shall not be accepting the decision of the division of Ramajanmabhumi at any cost where in the archeological evidence is totally on our favour. He said the whole land should belong to Hindus and Babar a foreigner and his masjid cannot be there. He also said how the appeasement has hurt this country and the policies of appeasement have been against Hindus. He opined arranging such Janagraha sabhas is not against the Supreme Court but against the delay meted out and disinterest been displayed. 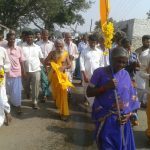 He said how for over 400 years fights have happened for the sake of building a Mandir at the place where Bhagawan Sri Rama was born, lived and ruled and many have guided us over the Rama Mandir and it is now our younger generation who have to make it happen so that it comes as a gift to our future generation. 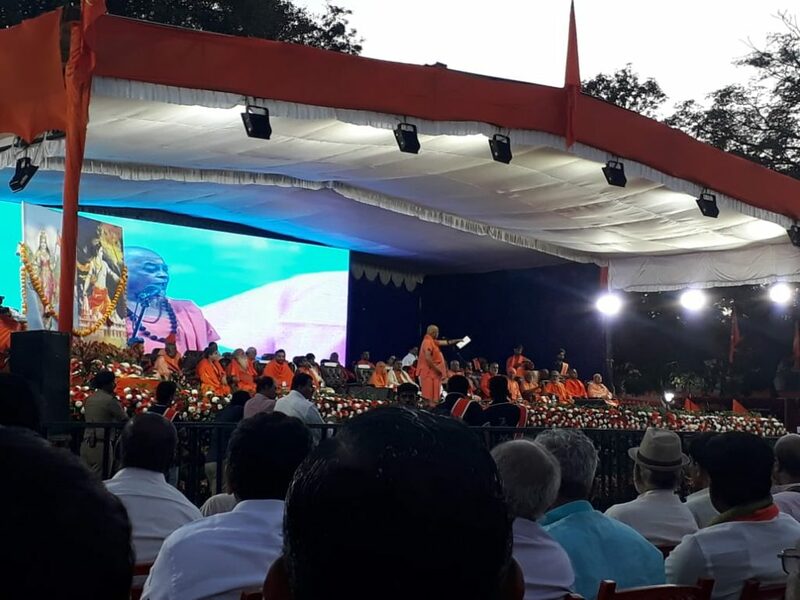 Sri Sri Vishwesha Teertha Swamiji of the Pejawar Mutt Udupi addressed the audience called for the people of all religions to unequivocally demand for the Ram Mandir. He said as in Ramayana where curse to Ahalya was relieved by the sparsha of Rama , we in Bharata have had the curse of not having the mandir and now the same will be eliminated and we ought to have the Rama Mandir getting constructed. 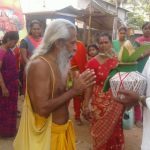 He said all sants have to reach out to PM Narendra Modi and demand for the same and he believed the PM Modi would also reciprocate positively. For that to happen he demanded all Sants to be together and in case needed should be ready for a Satyagraha and demand for the same. 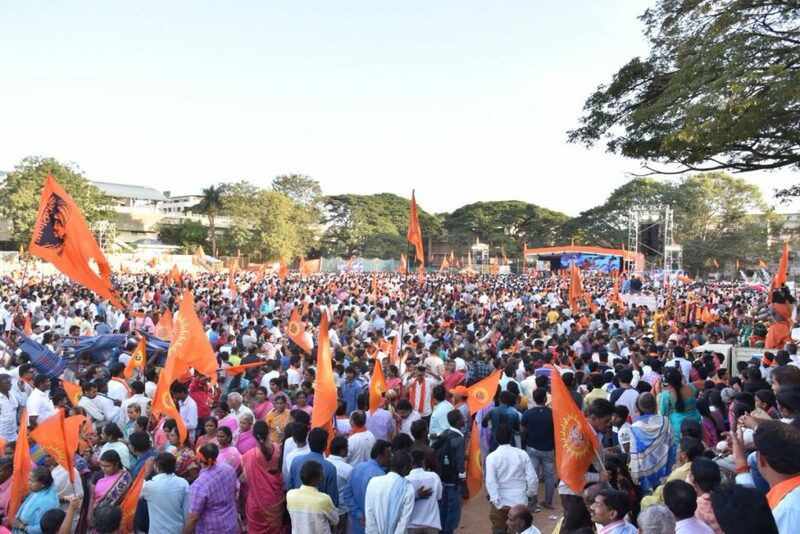 People from various places of Bengaluru and outskirts of Bengaluru arrived the National College grounds thru processions, rallies. 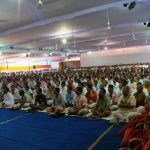 And Sri Chandrashekaranand ji, Sri Ramakrishna Seva Trust, Devasandra, Bengaluru were among the Swamijis who were seated on the dais. 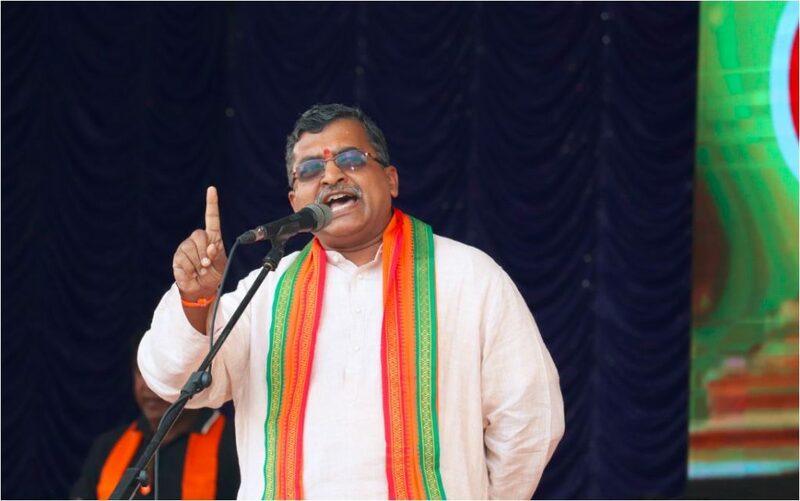 « ಅಯೋಧ್ಯೆಯಲ್ಲಿ ರಾಮ ಮಂದಿರ: ಇಂದಲ್ಲದಿದ್ದರೆ ಮತ್ತೆಂದು?